Four outgoing board members were presented with plaques at the Oct. 17 board meeting at the String & Splinter. 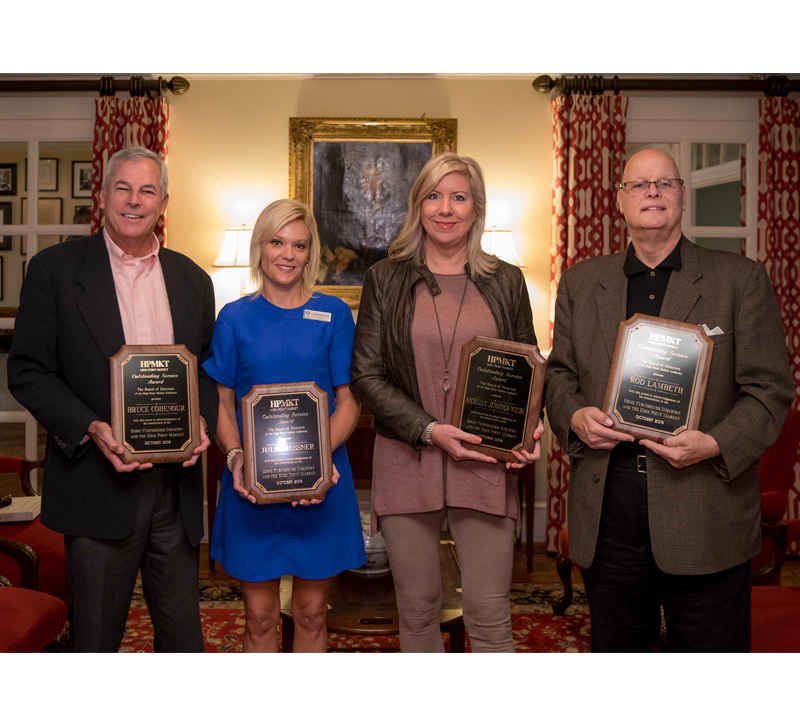 At its quarterly board meeting during fall market, the High Point Market Authority recognized several outgoing members of its board of directors for their service to the organization. Julie Messner, Senior Vice President of furniture leasing - High Point, and Michelle Jennings Wiebe, President of Studio M Inc., were recognized for their service as voting board members. Bruce Cohenour, Senior Vice President of Bassett Furniture, and Rod Lambeth, CEO of Tomlinson/Erwin-Lambeth, were also recognized for their service on the executive committee during their terms as board members. These four outgoing board members were presented with plaques at the Oct. 17 board meeting at the String & Splinter. The board meeting also concluded Jeff Scheffer’s reign as Chairman of the board. "It has been an honor to serve in this capacity for the past two years,” commented Scheffer, President and CEO of Universal Furniture. “The commitment and focus of the board members during my time as chairman, I believe, has left us well-positioned to keep moving market forward." Scheffer will remain on the board as Immediate Past President. Dudley Moore, President of Otto & Moore, will now assume the role of board Chairman. The next High Point Market is scheduled for April 6-10, 2019.